Inheritance from Mother (translated by Juliet Winters Carpenter, review copy courtesy of Other Press) is the story of Mitsuki, a middle-aged woman approaching a new stage of her life. The start of the novel plunges us into the middle of a phone call with her sister Natsuki, in which we learn of the death of their mother and of the money they calculate they’ll inherit. If that sounds rather callous, Mizumura soon reveals that the two daughters, particularly Mitsuki, have every reason to be relieved about their mother’s passing given the way they had to care for her, and the selfishness the old woman showed throughout her life. However, the mother’s death doesn’t bring Mitsuki as much relief as you might expect, mainly because of another major obstacle to happiness. Her husband, Tetsuo, has had several affairs in the past, but the unexpected discovery of a more serious relationship stuns Mitsuki, leaving her unable to decide how she should spend the last decades of her life. With her mother finally gone, she takes a well-earned rest at a hotel in the Hakone area a couple of hours outside Tokyo to decide how (and whether) she wants to go on, in the process falling in with an unusual collection of guests, all of whom have their own sorrows. 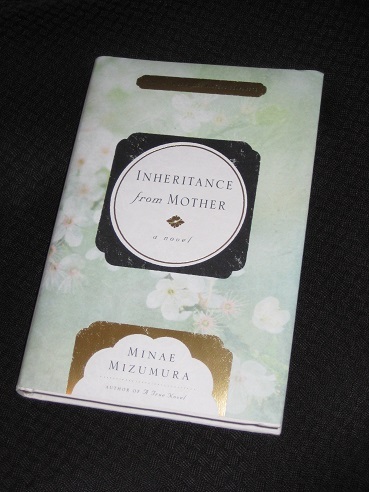 Inheritance from Mother was originally published between 2010 and 2011 in the Yomiuri Shimbun newspaper (sixty-six chapters divided into two parts) and pays homage to the old tradition of novel serialisation. For much of the novel, the story is certainly a page-turner, with each chapter of around seven pages pulling you on to try the next one, and luckily it has a lot more in common with A True Novel than with Mizumura’s non-fiction work. There’s a distinctly old-fashioned air to the work, in the best possible way, and the finished product from Other Press adds to this feeling, a sturdy hardback with a flowery facade. Mitsuki wondered about herself: was it because she was Japanese that she didn’t simply walk away and be done with her? Was she swept up in a cultural climate where a woman’s virtue had long been inextricable from her role as caregiver? Or was the prospect simply too exhausting? Did she sense that severing their connection would drain her of all her strength and that once her weeping and wailing were over, her voice a dry rasp, she would only take pity on her mother and so fail to extricate herself after all? Baffled, she continued to be her mother’s mainstay. Over the course of this first section, Mizumura also explores the ethical considerations and cost concerns involved in an elderly person’s prolongued illness. As Mitsuki goes from nursing home to hospital, we see how Japan is slightly behind the times in terms of both government assistance and the idea of dying with dignity. Mothers were supposed to be fair. This is nothing, though, compared to the mother’s treatment of Mitsuki’s father. When he falls ill, his wife simply sends him off to a nursing home and turns her back on him, leaving her daughters to spend time with him in the stark, depressing atmosphere of a place where people are sent to die. That scene doesn’t paint marriage in a very flattering light, and the perils of Japanese relationships turn out to be another major theme of the novel. In addition to the issues with her mother, Mitsuki comes to realise that Tetsuo never really loved her, in spite of all the sacrifices she has made for him (including giving up the opportunity to translate Madame Bovary into French because Tetsuo needs her teaching salary to be able to buy a condo in the heart of Tokyo). His subsequent betrayal leaves her regretting her marriage, but unsure as to whether she’d be better or worse off without him. This is just one of the book’s many failed relationships, though, and as the writer takes us back into the family’s history, we are witness to several marriage break-ups and scandalous affairs – and see that Mitsuki’s mother’s behaviour is foreshadowed by that of her grandmother. Of course, it’s Flaubert, not Camus, whose work underpins the novel. Quite apart from Mitsuki’s doomed attempt to bring Madame Bovary into Japanese, the book hints at the passions of the headstrong women of the family (which end just as badly, if not as tragically, as poor Emma’s delusions). For me, Inheritance from Mother doesn’t quite live up to Mizumura’s previous novel in English, but it’s certainly worth reading, and Winters Carpenter does her usual excellent job in bringing across the comforting, pseudo-Victorian style of Mizumura’s fiction, making this an ideal book to curl up with on a cold winter night (yes, it does get cold in Melbourne). The work successfully manages to examine the difficulty of being a middle-aged woman in Japan (trapped between care for the elderly and managing a marriage of semi-convenience) as well as harking back to the traditional Japanese serialised novel; if there are a few dull passages along the way, they’re more than made up for by the rest of the book. Kaggsy – I’m sure there are many people out there who can identify with Mitsuki (although there are probably more in Japan than most other places…). Wonderful review Tony. I still haven’t gotten around to reading A True Novel yet (Wuthering Heights is one of my favourite novels which I must also re-read at some point) but Mizumura certainly seems like a writer who doesn’t brush aside difficult social issues.